My husband and I have just spent a week at Villa Olivia and highly recommend it for anyone wanting peace and quiet within a short drive of restaurants and places of interest. The villa is very comfortable, with the bonus of air conditioning if required. The views are gorgeous and there is plenty of space for everyone and it was wonderful to have the lovely private pool to cool off in after a day exploring the area. We enjoyed having breakfast in the covered eating area outside the front door, and ate dinner or drank wine at the little table on the terrace by the pool, watching the spectacular sunsets. As the villa is only approx 40 minutes' drive from the airport it's an easy drive after your flight. Stane was very responsive with any questions I had prior to our trip, and as her brother lives nearby there is someone on hand locally should there be any issues during your stay. The area is not "touristy" at all, which is why we chose it. For eating out locally, we enjoyed meals at both Konoba Vinica Monkovic and Konavoski Dvori in Ljuta; both are on the river and serve really delicious food in a lovely setting. Further afield we recommend visiting Cavtat, about 25 minutes away; there is a lovely walk along the waterfront and around the headland, and we took boat trips from there to the Elafiti Islands and Dubrovnik (tip: visit Dubrovnik on a Tuesday or Thursday as less likely to be full of cruise ship passengers, though it will still be busy!). There is also a bus terminal for an alternative route to Dubrovnik and further afield. There are numerous bars and restaurants in Cavtat for more eating options and we ate in this lovely little town on a few occasions. Other places we visited were Sokol Grad, a fortress only a few minutes' drive from the villa, Cilipi to see the folk dancing in the square on a Sunday morning, and the Trsteno Arboretum north of Dubrovnik. We were only here for a week but in such a beautiful relaxing setting we felt we'd been away for much longer. Thank you so much for your fantastic and very detailed review Tracy. It sounds like you managed to fit so much in to 7 days, but glad that you still found it relaxing. Fantastic apartment with stunning outside space. Villa Oliva was perfect for the four of us. The apartment is spacious and well presented throughout, beds extremely comfy and everything is provided for you. The outside space is where Villa Oliva really takes your breath away. The views, the pool, the gardens and not to mention the sunsets are fabulous. This is a very special place situated in a wonderful region of Croatia. Thank you for leaving us such a positive review - we are so pleased that you enjoyed your holiday at Villa Oliva and hope to see you again. Perfect holiday! Communication excellent throughout. Location is spectacular and even better than the photos. Our first visit to Croatia and we’d happily return in a heartbeat! Thank you for your lovely review and we are so pleased that you had such a good holiday. Hope to see you again one day! Villa Oliva was a perfect base for us to enjoy this beautiful part of Croatia. Conveniently situated for day trips to Dubrovnik and the pretty resort of Cavtat, but far enough removed to enjoy the peace and quiet of its wonderful hilltop location. 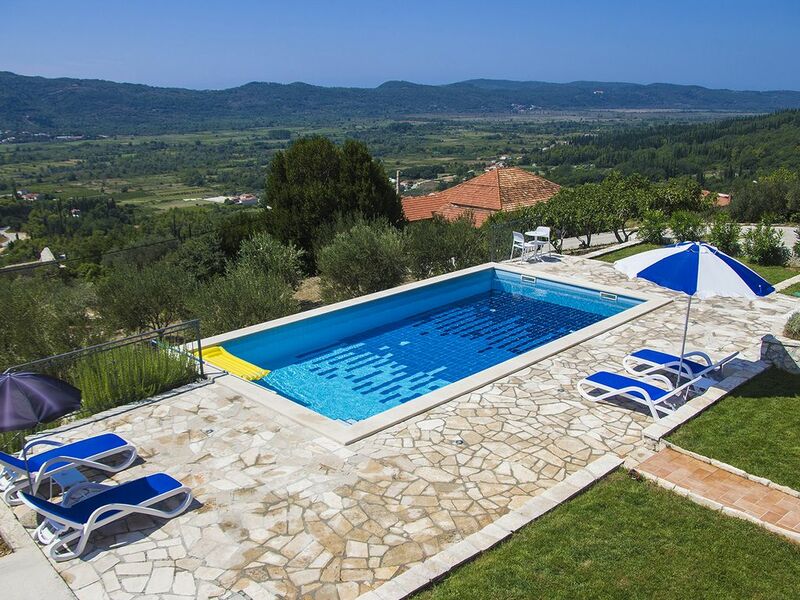 The villa itself is very well equipped with everything you need for holiday living, while the pool area enjoys spectacular views across the countryside. Thank you for your lovely review - we are so pleased that you enjoyed it all as much as we do! This beautiful modern villa is located approximately half an hour's drive from Dubrovnik airport and enjoys the most amazing views. There is a traditional villa next door owned by a charming local who gave us fruits from his orchard and there is a good degree of privacy as he was not there most of the time and this property is not overlooked by any other villas. The owners clearly take pride in their villa and this is reflected in the way it has been presented and furnished inside and out. All was as described in the villa details and the owner had clearly gone out of their way to ensure we would feel at home on arrival. We found the rooms to be clean and well maintained and the air conditioning very welcome ensuring a good night's sleep. The pool is lovely as well as the delightful BBQ area which we used on a daily basis. The local area is well worth exploring and visits to Cavtat and Dubrovnik must be on your list. We had a fabulous time at this villa. We have already recommended this villa to our friends and will definitely be returning for future visits. We spent an amazing two weeks staying here in the summer. The apartment itself was very clean and well equipped with everything we needed although we spent most of our time living outside! The views and sunsets from the terrace were fantastic and lovely to come home to after a day sightseeing in the local area. Our favourite spots were Cavtat for dinner in the evenings, Kupari for beach days and Dubrovnik for a bit of culture, although we did find it very busy there! We will definitely be back.